I know I spend way too much time on Pinterest, but what teacher doesn't? I'm so excited to be linking up with Upper Grade are Awesome for a Back to School Linky party. To pick only my top 10 is very difficult but here it goes! All of these pins make me so excited about making more things for my classroom this summer. I'm also super excited about deciding how I want to incorporate all the professional development books into my instruction next year. I've learned a lot from The Book Whisperer, Teacher like a Pirate and Whole Brain Teaching and it is fun to find pins that relate to those books. 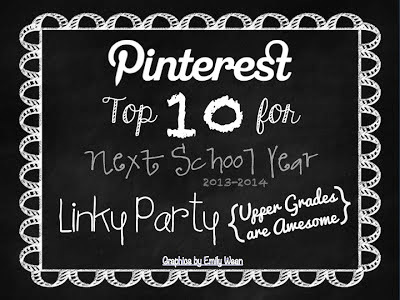 What do you have on your top 10 list for back to school?